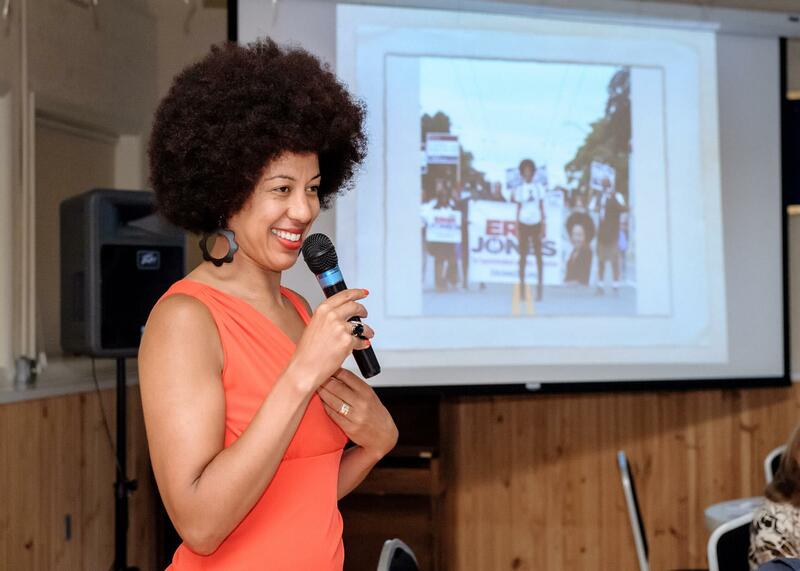 Erin Jones, fluent in English, French, Spanish, and Dutch, has been a champion for kids and education for 25 years, in many diverse communities. She was adopted by a Norwegian family in a very white and blond area of the US, then moved to The Netherlands, where although she was the only black person, nobody cared about hair or race. She attended a very expensive school where her father taught, and she met international dignitaries, including the wife of Anwar Sadat. After Erin told The Princess of Egypt that she was teaching herself Hebrew and Arabic to solve the Middle East Crisis, the princess said, “You are a world changer, Erin.” She was right, and Erin took her words to heart. She also had a teacher who pushed her, saying, “Being average is easy. I dare you to be great.” Erin rose to the challenge. Erin returned to see America at age 15, where, in Washington DC, she saw people who “all looked like me,” for the first time. She roomed with two black girls from South Carolina who helped her see, for the first time, that she could be pretty. She moved back to the US for college at 18. Erin has been applying her unique experiences and talents to help educators better serve diverse populations, inspiring others to become their best selves. In 2016, she was the first black woman to run for a WA state office (Superintendent of Public Ed), and lost by an agonizing 1%. She has since opened her own LLC on Culturally Responsive Practices, and will start her Ph.D soon.